I am still awaiting results of tests of the (spreading) pain in my hands – I’ve finally managed to get referred up the chain, but there is the usual 6-8 week wait now to see a consultant. Crafting time therefore is still very limited, but I have achieved a couple of small successes. I finished my version of Eva’s Shawl, Starry Starry Night, a beginner level shawl which I ‘pimped’ with beautiful Unique Sheep Eos yarn and some serendipitous beads. I’m really pleased with the resulting gorgeousness. The soft changes and multiple skeins of colour phase yarn worked really well in crochet (so many variegated yarns don’t work for crochet) and the whole is light and very warm. 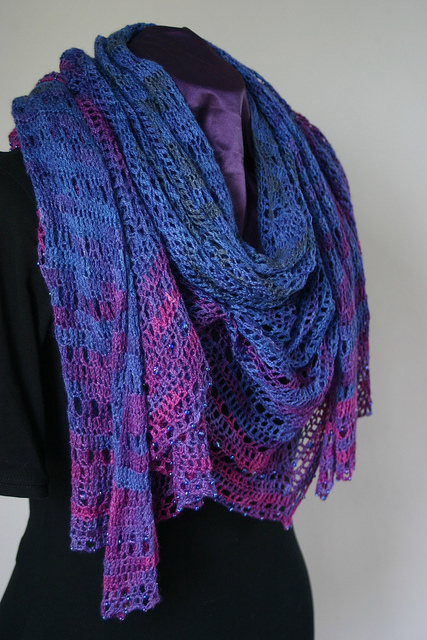 I finally managed to get Part 1 of my Crochet Chart reading tutorials up and on this site. I promise not to take so long with the other parts! I’d love to hear what you think – and of course there are the PDF’s as well. This month (as in next month, June) I’m hosting a CAL (crochet-a-long) over on Ravelry for the beautiful Recuerdos de infancia – the yarn I wanted to use I don’t have enough yardage for (isn’t it always the way?) so I think I might be going down the laceweight path and stash diving (after all, it’s not like I’m short of yarn here, and I really can’t justify buying any more without making something from stash first). Welcome to May, I can’t believe how fast this year is spinning by! 2012 has become the year of minor, but frustrating, injuries for me. February resulted in ‘interesting’ times after I broke the middle finger of my right hand – I’m left handed, so other than the (continuing) numbness it wasn’t the end of the world. Four weeks ago however I was getting a pain in my left thumb joint – it’s amazing how much you use your thumb when you realise you can’t – and that put a serious crimp in crafting time. Over the next couple of weeks it got worse and worse – resulting in a trip to the GP to try and find out what the problem was. I’m still awaiting results of the tests, I’ll let you know. In the meantime I’ve slowly worked back up to 15 minutes of crafting every other evening. I was surprised to discover how much I took ‘doing something’ while ‘watching’ something for granted, and how strange it was to actually have to ‘watch’ something (as opposed to having a film or DvD series on ‘in the background’) – and how bad many of these shows are! However, there is a point (unusually for me). 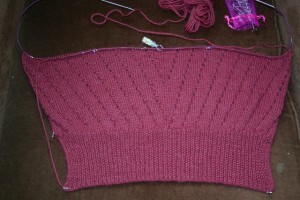 I’ve been working on the beautiful Honeymeade shawl, which combines crochet and tunisian stitches, for several months. 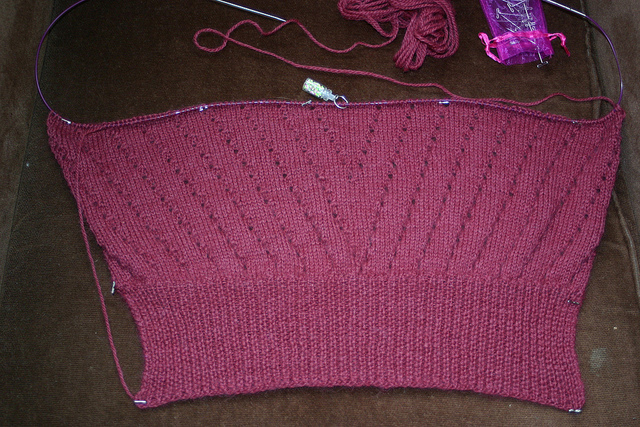 The pattern and I are having something of a battle – the first two yarns I picked for the project didn’t want to be the shawl and I’ve frogged and restarted more times than I care to count. Finally though I got hold of some beautiful fyperspates sparkle sock which doesn’t pool horribly and I can see the stitches and everything has been going swimmingly since. I finally managed to get out to the first ‘major’ charted pattern repeat, on Easter weekend when i was away. I’m a confident crocheter, and a little bit impetuous, and I glanced at the chart, worked out what I (thought I) needed to do and away I went. FOUR weeks of slow work later I finally finished that single row and returned to the pattern to find out what to do next. At which point I discovered that I had non-read part of the instruction for the previous row. Gah. Ripping out what I knew to be 4 weeks work was soul destroying. Ok, realistically it’s only about 4 hours work, but when crafting time is as limited as it is now 4 hours is a lot! One of these days I’m going to learn to READ a pattern. I do not know ‘better’ than the designer, I cannot ‘guess’ the next stage and the whole thing goes so much quicker if I take those 30 seconds to read the d*mn instructions!